Tim is Rock & Roll's legendary bassist that put the bottom end and drive in bands such as Vanilla Fudge, Cactus, and Beck Bogert, Appice. These stand out among his lengthy list of performance and recording credits. www.TimBogert.com... since 1997 - Celebrating 15 Years! Welcome to the official web site of Tim Bogert. Tim is the truly legendary rock bassist that put the thunder bass and amazing vocals in so many classic rock bands such as Vanilla Fudge, Cactus, and Beck Bogert Appice. Tim and drummer Carmine Appice are one of the most famous rhythm sections in rock history. Visit the biography page for his full story. In August, 2005, Tim was involved and injured in a serious motorcycle accident. Following a lengthy recovery, the trouper that he is he returned to touring with Vanilla Fudge in 2007. Sadly however, lingering problems resulting from the accident have forced Tim to reluctanly retire from touring. He is currently living in Simi Valley, California and still does session work locally and over the Internet. Tim can be contacted via his Facebook page. "If your timing is locked, you can get away with almost anything. James Jamerson, Paul McCartney, and Tim Bogert are classic examples of players using the entire fingerboard while serving the song. And there are times when it's a blast to cut loose. Players who can't or don't play a lot of notes shouldn't frown on those who do, and vice versa." Pick up the June edition of Bass Player magazine for the entire interview with Billy Sheehan, a self-described disciple and friend of Tim's. Also, check Tim's scrapbook for photos of Tim and Billy being inducted into the Hollywood Rock Walk of Fame in 1999, along with many other bass greats. Vanilla Fudge was inducted into the Long Island Music Hall of Fame on October 15, 2006 along with other greats, including Billy Joel, Joan Jett, Richie Havens, George Gershwin and many others! 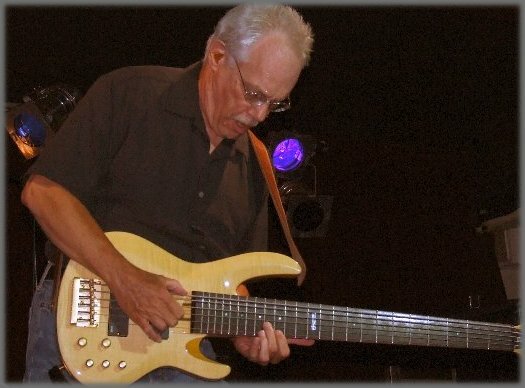 Tim Bogert, Master of the Electric Bass. Copyright © 1997 - 2013 Tim Bogert, unless otherwise noted. All Photographs Copyright © 1997-2013 Tim Bogert, unless otherwise noted.